What a gift it was to be a part of our NPH Charter Cohort Leaders’ first formal retreat! As part of their ongoing formation, retreats are an integral part of our US leadership program. Along with a priest from NPH Honduras, and Cheryl Sesnon, Consultant and Leadership Trainer for our NPH National Directors, the three of us facilitated discussions on various themes. Since our young people had just been the Featured Guests at their FIRST EVER FRIENDS GALA, fundraising event for NPH…we took time for their impressions and reflections! Everything from “I can’t believe all these people want to help US, without even “KNOWING” us, to the uncomfortableness in the experience of something SO NEW to each of them. People all dressed up, and fancy tables and fancy food and the auction!! That was especially intriguing to them! We were able to share with each of them, how ultimately proud we were of them, their courage, their smiles, and their willingness to jump in and help raise money for their family, their brothers and sisters! 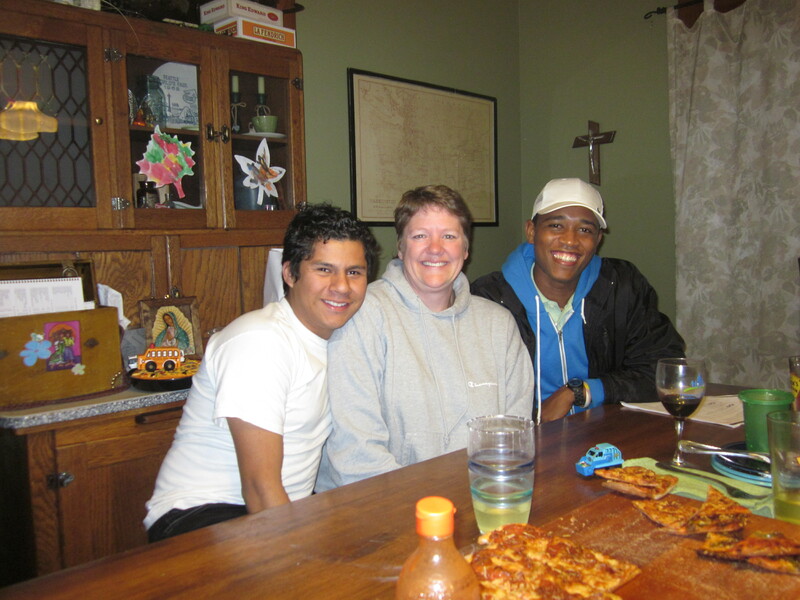 During these retreats we want our young adults to have regularly scheduled times in a safe, facilitated environment to share and reflect on their experiences of homesicknesses, newness, observations, comparisons, classes, relationships etc, while helping them to build an identity of a “team” here in the Northwest. They are pioneers of this NPH Generation. Other themes included Living in a Land of the Plenty. Fr helped us explore this theme inviting our young adults to share their experiences of “plentitude” in light of the gospel and teachings of Jesus. They have been living here for just over a month. They have experienced many examples of “plentitude”. Julissa shared that having her host family ask her each and every day, how she is, and how are her classes and listening to her, has been an experience of plentitude! The plentitude of food and huge beds and their own bedrooms and available transportation (insert other examples here) were just a few of their astute observations. Then the opportunity presents itself to integrate these amazing experiences of plentitude with their lives in NPH…what examples of plentitudes they experienced there…and finding the spiritual plentitudes…comparing them with material plentitudes…talking, reflecting, wrestling with these truths and holding deep the gifts of family they have received in their NPH family. We shared laughter, song and music (in English, Creole and Spanish) in an environment of faith and rich cultures. Teambuilding activities rounded out our retreat! A big thanks to Julie Callahan who provided us with a stupendous location, amazing hospitality and celebrated with us at days end over a simple delicious meal. We continue on this journey together…reflecting, learning, growing, sharing in a sacred, loving atmosphere! Eight years ago when I became Helen’s sponsor, the letter I received from the director of NPH Guatemala said “Welcome to our family.” At the time I didn’t really understand what that meant. But over the years as I have met and spent time with NPH staff, volunteers, pequeños and pequeñas, I have often felt part of the family. But never before have I felt this so much as I did last Friday. Friday was my birthday and I was expecting a quiet evening at home with my husband, our boys and our son for the year, Emir. Our boys asked over and over again when could they have cake and when would I open presents. I told them we would wait until Emir came home from school. They hesitantly agreed and anxiously watched for Emir’s arrival. When he walked in the door, they were very excited. Now we could have cake. Emir went to put his backpack away – or so I thought. A few minutes later I heard singing. Around the corner came Julissa and Wendy carrying a cake with Emir behind them playing the guitar while they all sang “Las Mañanitas”, a traditional Latin American birthday song. We were joined a bit later by Jean-Francois and Kara. What a wonderful surprise and honor! As everyone settled in around the table and began eating and visiting I looked around. I realized that this is what the greeting meant eight years ago. We are part of the NPH family and they are a part of our family. Thank you Emir, Julissa, Wendy and Jean-Francios for making my birthday special and for being a part of our family and allowing us to be a part of yours. This past weekend was the Friends of the Orphans Northwest World of Dreams Gala in Bellevue, Washington! From the Bellevue club on the 25th floor guests had wonderful views of the sun setting over the Olympic Mountains to the west. The evening featured a silent auction raffle during cocktail hour. Attendees, longtime Friends/NPH supporters and new alike, mingled and enjoyed a glass of wine while Juan Manuel of El Salvador played guitar and sang. Emir then joined Juan Manuel and they played a couple of songs together. There were tables set up with information and pictures from each home so that while people talked and mingled they could also see scenes from each of NPH’s nine homes. The group then moved into the dining room where dinner and a live auction awaited. Every year the live auction features a special item that is highlighted. This year the International Leadership Program, in its pilot year, was that item! Each of our 5 leaders spoke of their gratitude for the opportunity to be able to participate in the program and shared how they hoped the program would prepare them to return to their respective NPH homes and give back. Each of the leaders addressed the group in English and did wonderful jobs. Each had put a lot of time and practice into the words they spoke, sharing their hopes and dreams for the program and their respective futures. Everyone was impressed not only with their English abilities, but also with the confidence with which they stood up in front of everyone and shared their story. It was inspiring to have living examples of what the unconditional love the children in NPH receive can realize, and what confident and compassionate young adults it creates. The evening was a success raising around $50,000. Digyana did her part by standing and giving an impromptu sales pitch for the trip to NPH Honduras being bid on during the live auction! As always, the evening served as a wonderful chance to bring together people who have been deeply touched by the work of Friends of the Orphans and NPH in various capacities. The evening was made that much more special having the leadership cohort present as representatives of the next generation of “pequeños” that will lead the homes and organization in the years to come. In 2000, my husband Ethan and I moved to NPH Honduras to volunteer for a year, just a week after our wedding. Our friends joked that it was our “left wing honeymoon” and wondered if after spending a year with 600 children we would ever want to have our own. As it turned out, spending a year at NPH has broadened our family in ways we could not have predicted. As volunteers, we each had jobs during the day- Ethan as an English Teacher while I worked in the Vocational Workshops. Each night we spent time with the 13-15 year old girls in the household called “Hermanas de Jesus”. Those evenings were where we really learned to be parents. We ate dinner together, helped to clean up, and then assisted the girls with homework, played games and listened to music, talked and sang and watched movies. There were challenging times – arguments and disagreements, times where kids pushed our boundaries, needed discipline, and moments where we questioned why we had travelled so far and given up our jobs and our own families to serve at NPH. We were lucky to have Wendy in our household, when she was just 15. She was outgoing and friendly, and she jokingly insisted that we call her “la princesa”. Even as a teenager, Wendy was a great kid. She studied hard, helped with chores and was well liked by the caregivers and other volunteers. 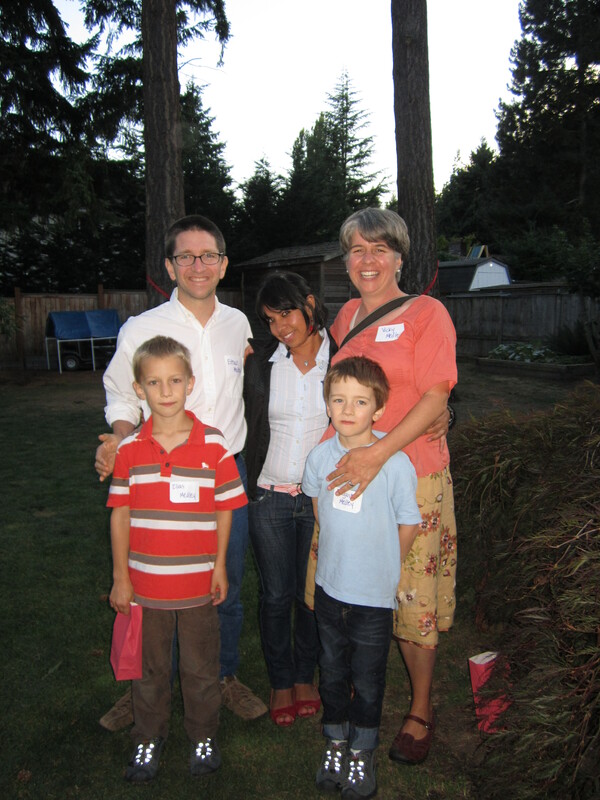 She was a bright spot in our year at NPH, and when we came home, we were delighted to become her sponsors. In the first few years I’ll admit that we weren’t the best sponsors. We were swept up with our own children, who were born soon after we finished our volunteer service. Wendy’s photo was always on our refrigerator, and our boys have grown up thinking about her and talking about her. They know that she loves dolphins, but they aren’t always sure about exactly how she is related to us. Once I overhead one of my boys say “My parents lived in Honduras and they liked it so much that they adopted a daughter there”. Hmm, clearly they knew she was important, even if they got the details wrong. These past few years we’ve been better about sending Wendy photos and letters, and even more recently we’ve been able to communicate over emails. We were thrilled when Wendy was selected to participate in the leadership program. What joy to have her just up the road for the whole year! We excitedly drove up to Seattle for the welcoming mass and dinner, and earlier that day were able to sneak off with Wendy for several hours. When we spent the day with Wendy, I was surprised by how motherly I felt toward her. Maybe it’s because I am a mom now, and I was not the last time I saw her. Or maybe it’s because I am surrounded by boys in my family and it feels great to have a daughter! Anyway, we had a great day with Wendy, mostly because she feels like family. She is family. My boys were immediately comfortable with her, and she very sweetly refers to them as her “hermanitos” (little brothers). Throughout the day she and I talked- about how she loves to learn more about her sponsors, her career goals, balancing a career and family, relationships, having kids, her education, the opportunities available in the US, and on and on. Next month she’ll join us for Thanksgiving, and I can’t wait to hand her an apron, roll up our sleeves and cook together. I look forward to having her in our home, to share her smile, her blooming English skills, her stories of NPH Honduras, and her love of children. We will welcome her at our Thanksgiving table basking in joy of being with family. Pizza Party and Football Game! This past Friday evening the Fitton family, hosting Emir this year, invited the program participants and other friends for a pizza party. Emir, Julissa, Digyana and Jean Francois were joined by Digyana’s host family, the Schulers, as well as number of the program’s supporters. We talked about the first weeks of classes and how much work they have been. Each had good things to share about their experiences so far, but their tired faces showed it has been a lot of work. We enjoyed round after round of famous Dave Fitton pizza as they kept coming out of the oven every 20 minutes or so. Each of our leaders are in different classes at school and have been forced to use what English they have to talk with their classmates and teachers. It may be difficult now, but this will pay off wonderfully in the long run. After pizza Julissa, Emir, and Jean Francois attended their first football game to cheer on Max Bubar, of the Bubar family hosting Julissa this year, in his high school’s game. It was a cool October night in Seattle, but the rain held off and Max’s team won. Julissa, Emir and Jean Francois enjoyed experiencing an American high school tradition, a homecoming football game. Thank you to the Fitton Family for hosting such a fun, and delicious, party! Last night, Julissa and I had the opportunity to see the musical “Saving Aimee” at the 5th Avenue Theater. We hurried downtown after a meeting with the leadership group at Seattle Central and arrived just in time for the opening act. I was so impressed by how much of the (entirely in English) show Julissa understood! Her English is improving so quickly thanks to her hard work in classes and willingness to take risks and try! The outing also gave us ample opportunity to chat, and her passion for life is contagious! The theater was promoting a spring production of “Titanic” and Julissa was VERY excited about that. Hopefully, the entire group will be able to see that show! Last week the NPH leadership group had the opportunity to attend iLEAP’s open house at their new location in Wallingford (a Seattle neighborhood). The event celebrated their move and the arrival of their fall 2011 fellows. Our leaders had the wonderful and exciting opportunity to hear from these community leaders from around the world as well as to speak with many of them after the formal presentation. Wow, it’s incredible and surprising what people do for others without knowing them. Tuesday the 27th of September we had the opportunity to meet the group iLEAP: The Center for Critical Service. It is a non-profit organization with the mission of cultivating and inspiring a new generation of world citizens. The group provides education and professional transformation programs in Seattle. It collaborates with leaders from Asian, African and Latin American communities. The programs are developed in close collaboration with other non-profits, businesses, and universities around the world. We were able to meet, from this group, a woman from the Dominican Republic, two women from Honduras, one from El Salvador, one from India and I cannot remember the rest. Each taught us a little about their programs. The woman from El Salvador said she knew of NPH. She worked with the government in El Salvador and one of the organizations she dealt with was NPH. We were very excited to know that we (NPH) are well recognized. It was nice to be able to speak with them in Spanish because the presentations were in English and difficult to understand. The woman from Honduras had difficulty presenting in English but she tried which is the most important part. I think that each of us, as an individual, should create our own limits, goals and projects and visualize our future with dignity. We are all grateful to iLEAP for the opportunity to attend their open house and wish them all the best during their 2011 fellowship program! Wow es increíble y sorprendente lo que la gente hace por los demás sin conocerlos. El martes 27 tuvimos la oportunidad de conocer al grupo de iLEAP: El Centro de Servicio Crítico. Es una organización internacional sin fines de lucro con la misión de cultivar e inspirar a una nueva generación de ciudadanos del mundo. Llevan a cabo programas de educación y de transformación de formación profesional en Seattle y colaborar con los líderes de la comunidad a través de Asia, África y América Latina. Ellos desarrollan sus programas en estrecha colaboración con las organizaciones sin fines de lucro, asociaciones, empresas y universidades de todo el mundo. Tuvimos la oportunidad de conocerlos y hay una de Republica Dominicana, dos de Honduras, una de El Salvador, una de la india bueno en realidad no recuerdo a todos pero lo importante es que cada uno dio a conocer sus proyectos la de El Salvador dijo que conocía a N.P.H. Dijo que trabajaba con el gobierno y entre los grupos que tenía estaba N.P.H. Nos emocionamos al saber que somos reconocidos. También nos emocionamos que había alguien con quien pudimos hablar en español ya que era muy difícil su presentación porque fue en inglés. La de Honduras no podía mucho pero lo intentó y eso es lo más importante. Pienso que uno como persona debe de ponerse sus propios límites, metas y proyectos y visualizar el futuro con dignidad.